We knew it. It was too good and beautiful to be true. Imelda Marcos’ conviction for several counts of graft by a Philippine court and sentencing her to imprisonment for multiple years, forfeiting her bail, and ordering the issuance – not the arrest – of a warrant of arrest, was so surreal. In a gratuitous and utterly discriminatory remark, the Philippine police chief added even more to the cynicism by hedging on the seemingly imminent arrest of the flambouyant Dictator’s wife, lamely using her advanced age and gender as a silly excuse, which has no legal justification at all. And then comes a rather unorthodox motion by her new counsel obviously intended to damage control her and her counsel’s failure to attend the promulgation of her sentence. The unilateral motion was evidently also designed to defeat or preempt the actual issuance of a warrant for her immediate arrest. And so it came to pass that by a mere motion of a convicted plunderer, the Philippine court “deferred” and bid its time in the actual issuance of the arrest warrant against an accused who has lost all legal remedies by reason of her failure to attend the said promulgation. 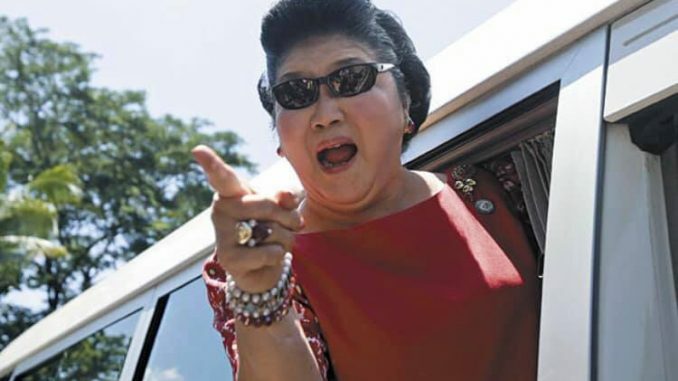 So it does not come as a surprise at all that today, the imeldific Imelda was allowed by the court to post bail anew, pending appeal of her conviction to the Supreme Court, where it will be an entirely new ballgame, so to speak. So after 27 long agonizing years, the Filipino people are again made to wait for the reckoning. Meantime, Imelda can go on partying the nights away, run for elections together with her forgetful eldest daughter, and wait for his son, the dictator’s namesake, to become president.